Sellout crowds were not a fixture yet, but more of the excitement of Camp Randall started to hit me. This would be the year where college football moved to the top of my flurry of interests. The past few years, selling me on spending an afternoon watching football was a challenging task. However, my stubbornness subsided as I began to absorb the fantastic spectacle of this sport. With about five minutes left and the game secured, I opted to leave and get a head start on tailgating. This kind of crazy delusional thinking was the error of my youth. Although tailgating is a must, you NEVER EVER leave a game – even if your team is down by seventy with seconds left in the fourth quarter – never leave. I’m not saying that a team could come back from that kind of a deficit, but as a fan, you are still part of that atmosphere – it is still part of the compelling experience that is college football. And above that, I have seen people leave early and miss some extraordinary finishes…the kind that you tell your grandchildren about at Christmas in front of the fire. The moral of the story – never leave a college football game…it can affect several generations to come. 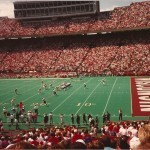 A sun-splashed Camp Randall sees the first game of Alvarez’s magical 1993 season. An almost sellout crowd would soon be turning into the toughest ticket in town.